Guide Price £795,000 - £825,000. 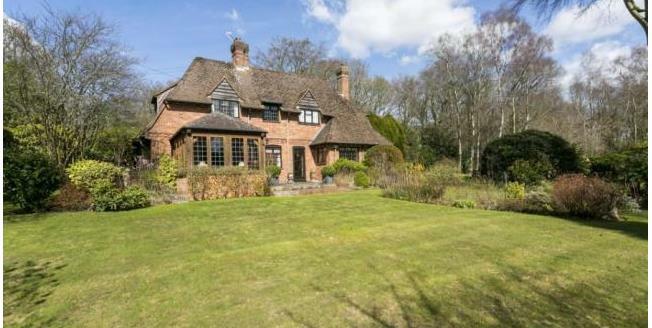 An attractive Lions Green property built in 1953, set within an acre (TBV) of beautiful mature gardens and benefitting from direct rear access into Darch's Wood; an area of protected land amounting to approximately 40 acres of beautiful bluebell walks. Nestled back within it's plot, the property is almost out of sight from the lane itself - a long gated driveway leads to a detached double garage with a motorised door, ample storage in the roof space above and a workshop behind. The gardens are bustling with a range of mature trees and shrubs and feature a wild flower meadow, an Amdega cedar wood summerhouse and various seating areas. Looking back at the property you will notice beautifully detailed brick elevations, reclaimed/original leaded light windows, interesting cat slide rooflines and a feature window with a trademark eyebrow. A garden room extension blends in seamlessly and looks just as stunning on the outside as the views do from within. The property is situated in a sought after rural location backing on to protected woodland and is within easy reach of amenities (including a fantastic bakery!) at Cross in Hand. The picturesque village of Waldron lies approximately 2 miles to the South and is home to the very popular Star Inn. The market town of Heathfield with its range of shops and amenities providing for most day to day needs is about 1.5 miles away whilst the spa town of Royal Tunbridge Wells and the coast at Eastbourne are within 16 and 17 miles respectively. There are mainline railway stations conveniently located close by at Buxted, Jarvis Brook, Wadhurst and Stonegate and all being within comfortable driving distance. The district is well served by a good range of state and independent schools together with excellent sporting and recreational facilities including several golf courses, a nearby rugby club, cricket, sailing and horse riding.